We’re what…a month into the school year? and I’m already getting pushback on school lunches. My kids hate eating the same old sandwiches day in and day out and I hate sending them to school with boxes full of food I’m pretty sure I’ll be unpacking and throwing away at the end of the day. School lunch offers so many distractions! Imagine trying to eat when the kid next to you is poking you in the shoulder with one finger and sticking a carrot up his nose with another. Little Mary with the blonde ringlets is belting out the crescendo from Frozen track 5 (you know the one) when someone shouts that there’s a hummingbird hovering in the classroom window and, while craning their necks to look, a flashy firetruck whips by the opposite window wee-awww, weee-awww, and everybody topples out of their chairs trying to see everything at once. In the blink of an eye, lunchtime is over, the sandwich left untouched, because – lets get real – ham and mayo on wheat, crusts ON, lost the battle before it even began. The kids arrive home three hours later, sobbing and catatonic because they haven’t eaten since breakfast and spend the next hour hoovering snacks from the pantry while you try to assemble a dinner they won’t eat because they’re too full. To reverse the vicious cycle, I came up with a sandwich that rises above the noise, a beacon of light in the chaotic fog of the cafeteria. My mom used to send me to school sometimes with banana bread and cream cheese sandwiches. It was like lunch and dessert all in one and it always captured my attention because it was so different from the norm. I didn’t have any bananas on hand, but had a plethora of carrots (think carrot cake with cream cheese frosting) and a huge zucchini from my friend’s garden. So, I grated the veggies and added them to a quick bread batter with some raisins and applesauce for additional sweetness. I baked the bread and sawed a few slices, spread them with cream cheese and sandwiched them together. 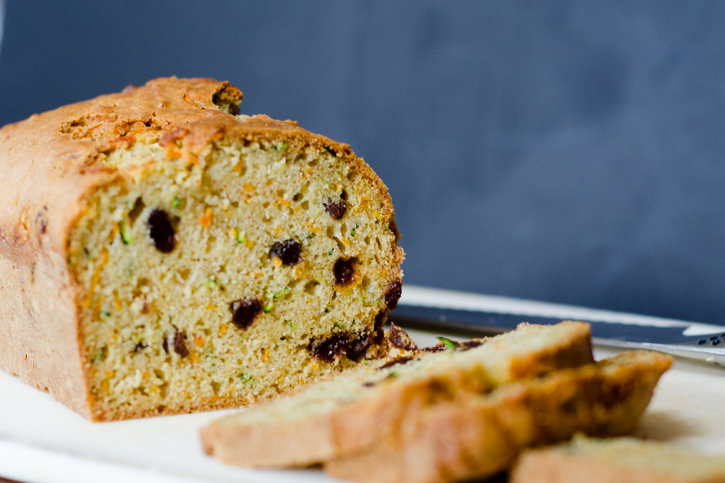 Flecks of shredded green zucchini, orange carrot, and black raisins offer pops of color and great texture. And, the cream cheese adds some substance. This sandwich is interesting. 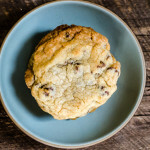 It toes the line between school lunch and sweet treat and makes the kids feel like they’re somehow cheating the system. Most important, it finally FINALLY captures their attention. This one didn’t leave the lunchroom. *For more lunch ideas, check out the shiny new School Lunch tab in the Browse By section of the site, housing everything from specific lunchtime meal ideas and accompaniments, to dinner leftovers that will also pack well for tomorrow’s lunch. 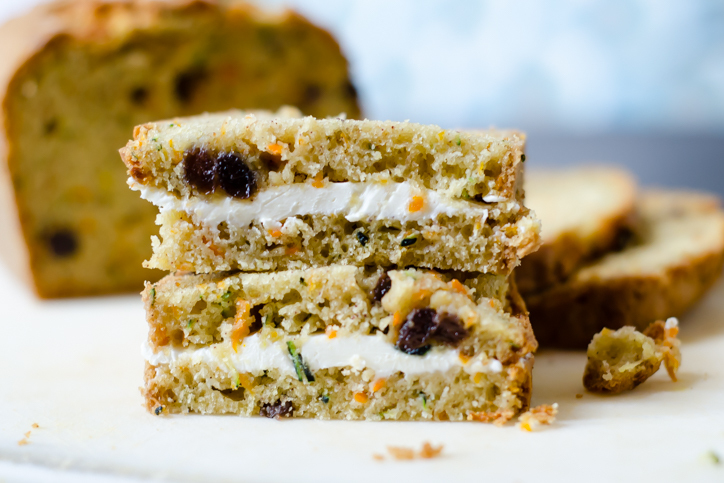 This bread combines zucchini and carrots with raisins and applesauce for a moist snacking bread that also tastes great in a sandwich with whipped cream cheese. 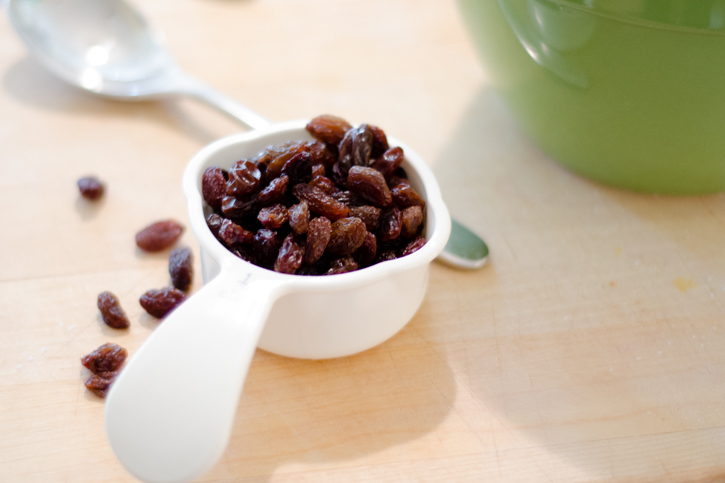 It works for school lunches, breakfast, brunch or a hearty afternoon snack. The bread yields about 12 3/4-inch slices, or approximately 6 sandwiches with about a tablespoon of whipped cream cheese per sandwich (or more if desired). Wrapped tightly, it will hold up to three days at room temperature, and can be frozen for up to two weeks. Preheat the oven to 325 degrees and place a rack in the middle. Grease the bottom and sides of a rectangular 9x5 inch loaf pan with butter. Dust the sides and bottom with a handful of flour and discard excess. Sift the remaining 2 cups of flour, baking soda, baking powder, salt, and cinnamon into a small bowl and set aside. Crack both eggs into the bowl of a stand mixer fitted with the whisk attachment. Beat on medium-high to break the yolks and add the sugar. 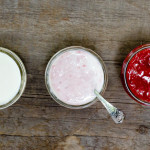 Continue to whisk on medium-high until the mixture is fluffy and pale in color, about 5 or 6 minutes (or 8 to 10 minutes if using a hand mixer). Reduce the speed to medium and add the oil slowly, so it emulsifies (it should take about 30 seconds). 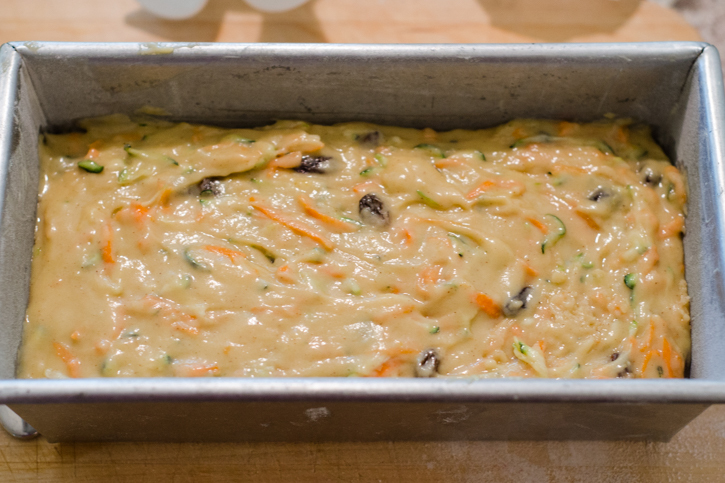 Add the vanilla extract, applesauce, zucchini, carrots, and raisins and whisk until combined. Remove the bowl from the mixer and add the flour mixture. Fold the dry ingredients into the wet using a spatula. Mix until just combined. Scrape the batter into the prepared 9x5 inch pan, careful to spread it into the sides of the pan. Rap the pan on the counter a few times to even it out. Slide the pan into the oven and bake, 60 to 70 minutes, until the bread is a deep golden brown, the sides of the bread begin to pull away from the pan, and the top springs back when lightly pressed lightly with a fingertip. If the middle sinks when pressed, the bread isn’t ready. Remove from the oven and cool in the pan for about 30 minutes. 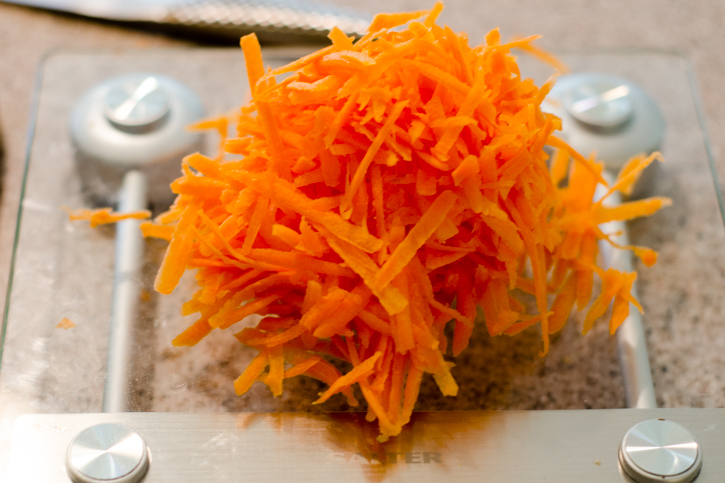 Remove from the pan and let cool to room temperature before slicing. The bread can be wrapped in plastic and held at room temperature for up to three days, or frozen for up to a few weeks. Cut two slices from the loaf of bread, each ¾-inch thick. 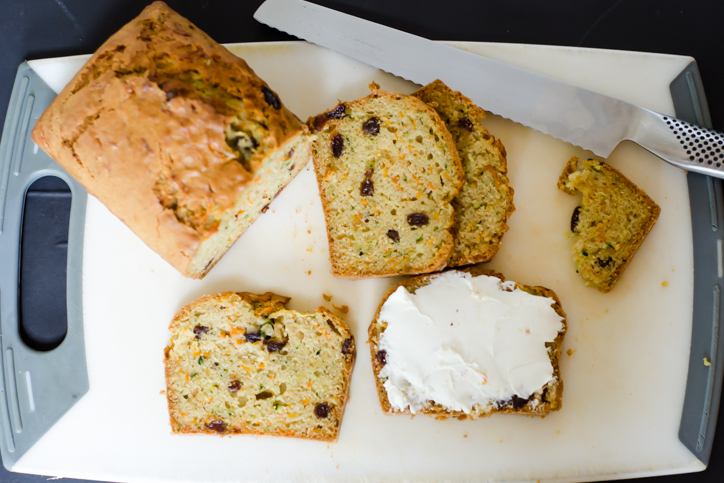 Spread one slice with about a tablespoon of cream cheese (more if desired) and top with the other slice of bread. Slice in half and serve or pack for a school lunch. 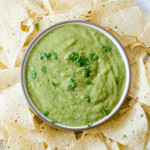 I came here via NPR where your recipe was featured. I had to make a few last minute changes including using a grated apple in place of the apple sauce, and the loaves (I doubled the recipe) came out beautifully. Thank you! Nicolette: Thanks for visiting and for your comment! 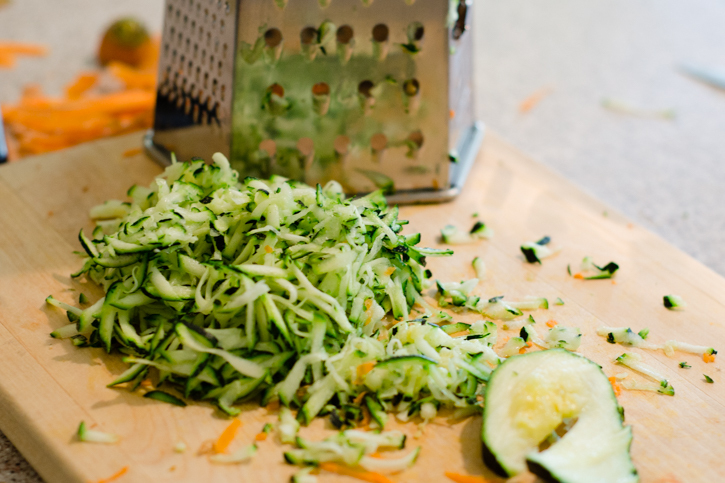 I love hearing about substitutions/alterations – in my opinion, a recipe is never set in stone. I’ll definitely try the shredded apple sometime. Great idea!